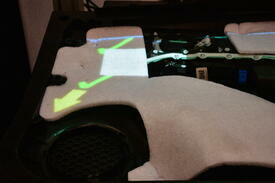 You are here: Home / Nysus Solutions Blog/ It's Automation Season! 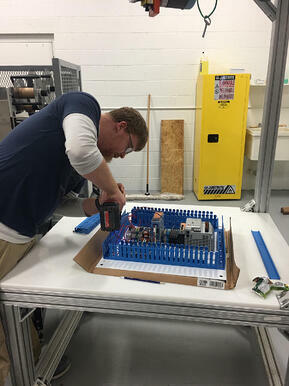 Our Automation Team is in full swing with a number of exciting new automation projects! 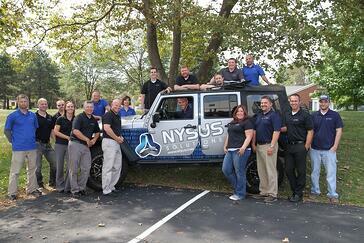 Check out some pictures and learn a little more about what Nysus Automation can do for you! Nysus Solutions was awarded an exciting project with a new customer to supply Injection Molding Tending Cells to assist in eliminating a time-intensive manual process. 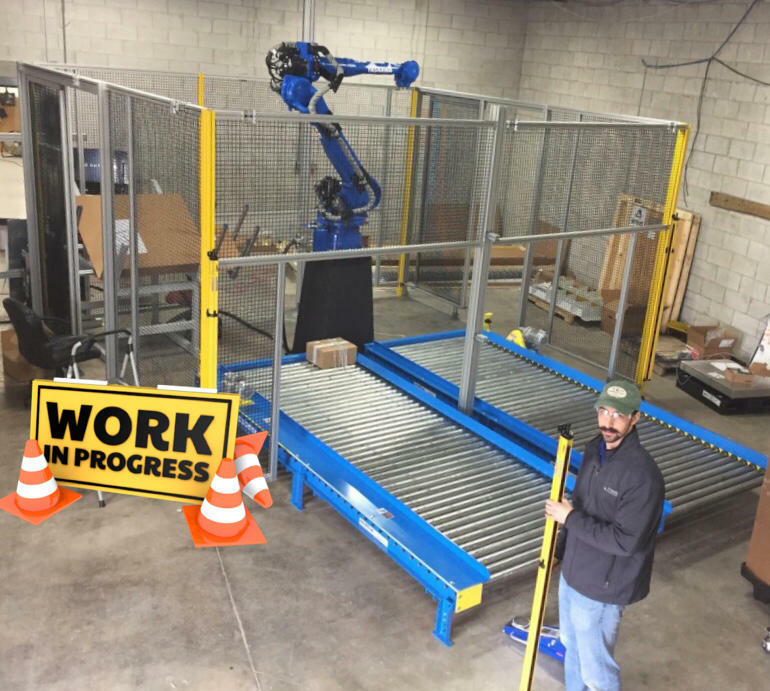 This robotic integration project allows our engineers to do what they do best - design a custom solution to help our customers save time and money while reducing quality issues occurring in their production! 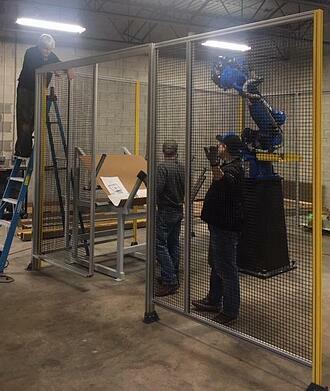 Pictured L: Our engineers are hard at work setting up the 1st Robotic Work Cell. Pictured Top R: The completed cell. Pictured Bottom R: Addition of roll conveyors completed. 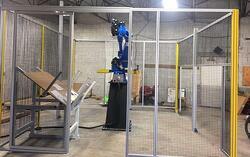 We've expanded our facility to accommodate fully functioning robot cells! This 4,000 sq.ft. 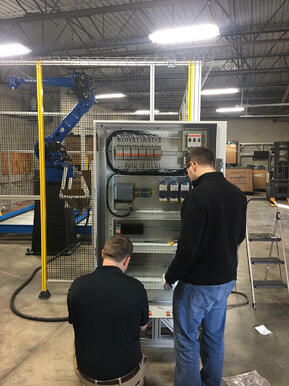 expansion allows us to build out complete cells and perform test runs prior to installation at the customer site. Many of our robotic integration projects have our Automation Engineers building panels in our shop. Whether it's developing a start to finish operation or integrating existing products at the customer site, Nysus Solutions provides high-level assistance at any point of your project timeline. Pictured L: Dave C. assembling panel components. Pictured R: Dave V. and Tristan B. working together on panel configuration. Our Engineers have over 50 years of combined experience with manufacturing automation. We don't just have the knowledge & expertise - we've also got the experience needed to get the job done right! What do you do when a customer needs Nysus Solutions Software and Automation - but is short on space? You develop a custom solution! 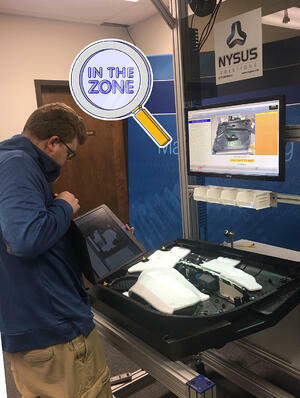 This all-in-one station combines Nysus Solutions' Manufacturing Execution System with Spotlight Guidance, Pick to Lights and Vision Inspection to give this customer the right fit for their needs! Pictured L: Dave C. making programming changes for better system performance. Pictured Top R: Example of the Pick Light integration. Pictured Bottom R: Example of the Spotlight Guided Instructions. Combining our Automation solutions with our Software systems, such as the Nysus Solutions Manufacturing Execution System, allows for a seamless process flow on the line. Already have a software solution in place? No problem! 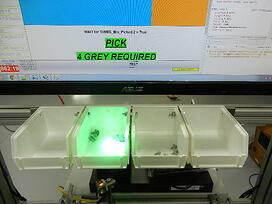 We can integrate our products with existing systems as well.